Eye anatomy. 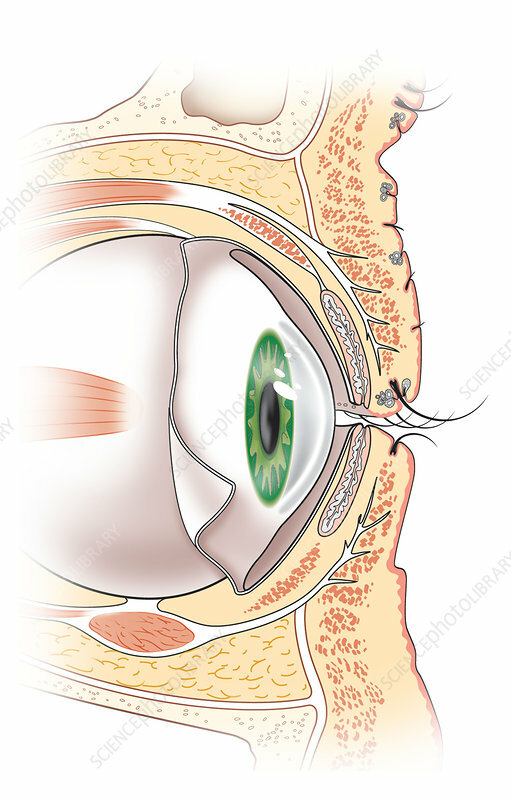 Artwork of the external structures of the human eye seen in sagittal section with the front of the eye at right. Structures shown include the eyelashes, the eyelids, the cornea, the iris, the sclera (white of the eye), and surrounding fat, muscle and bone tissues. The iris (here, green) is a ring of pigmented fibres controlled by muscles that contract and relax to control the size of the pupil (black) through which light passes into the eye. Within the eyelids are the meibomian glands (tarsal glands) that help lubricate the surface of the eye.